Founded in 1978, CTD is the largest and oldest member-driven cross-disability organization in the state. "Cross-disability" refers to all types of disabilities and different essential needs, rather than a particular disability or subset of disabilities. CTD envisions a future where all Texans with all disabilities may work, live, learn, play, and participate fully in the community of their choice. We focus on governmental advocacy, public awareness activities, and professional disability consulting to make Texas a leader in disability-related public policy and culture. 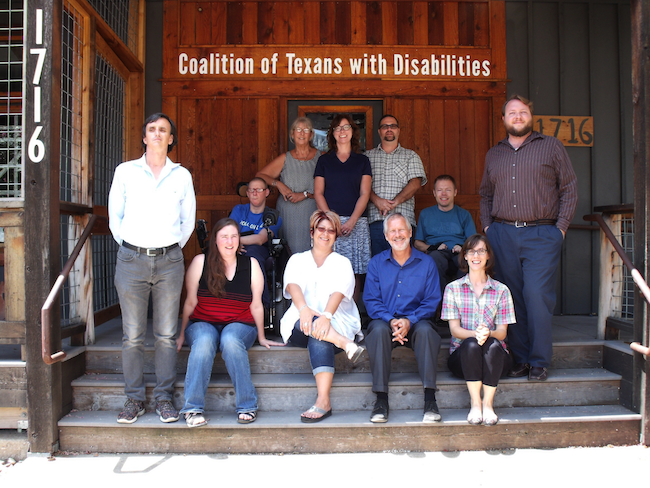 Our staff and members work with legislators, state agencies, and partner organizations to create public policy that protects or empowers Texans with disabilities. And, we organize collaborative awareness raising events, such as letter writing campaigns, rallies and presentations on subjects such as accessible voting, civil rights, and new state level initiatives with the potential to affect the disability community. 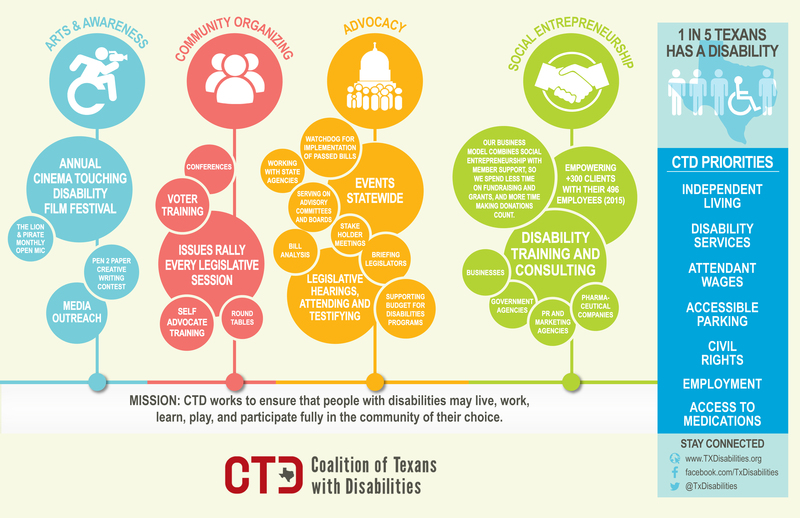 CTD is a recognized leader on a number of policy areas, among them, accessibility, civil rights, and Medicaid. Our legislative priorities are directed by our members, and we call upon them throughout the year to advocate at the local, state, and federal level. We bring our expertise and experience to a variety of professional groups and businesses, from architecture and construction firms to health care companies to state agencies. Through trainings, research, and other services, CTD increases accessibility, positive interactions, and smart practices within the business community. Entrepreneurs ourselves, we run an in-house Financial Management Services Agency, our CDS Division. Engaging the general public contributes to positive cultural shifts, and for this reason, CTD is committed to holding outstanding public awareness initiatives. Each year, we produce events and presentations that focus on disability in the arts, sports & recreation, and consumer education, most notably, our award winning Cinema Touching Disability Film Festival & Short Film Competition. Our staff (L-R, back row): Susie angel, Denise Ellison, Karen Glover, Chris Masey, Chase Bearden, Kit Cuny. (L-R, front row) William Greer, Erin Jones, Rosie Williams, Dennis Borel, Laura Perna.